This month's game is on long range reconnaissance and patrolling operations in Vietnam. Players will operate as small teams tasked with various missions, often behind enemy lines. Here is a small portion of the map we will be using. 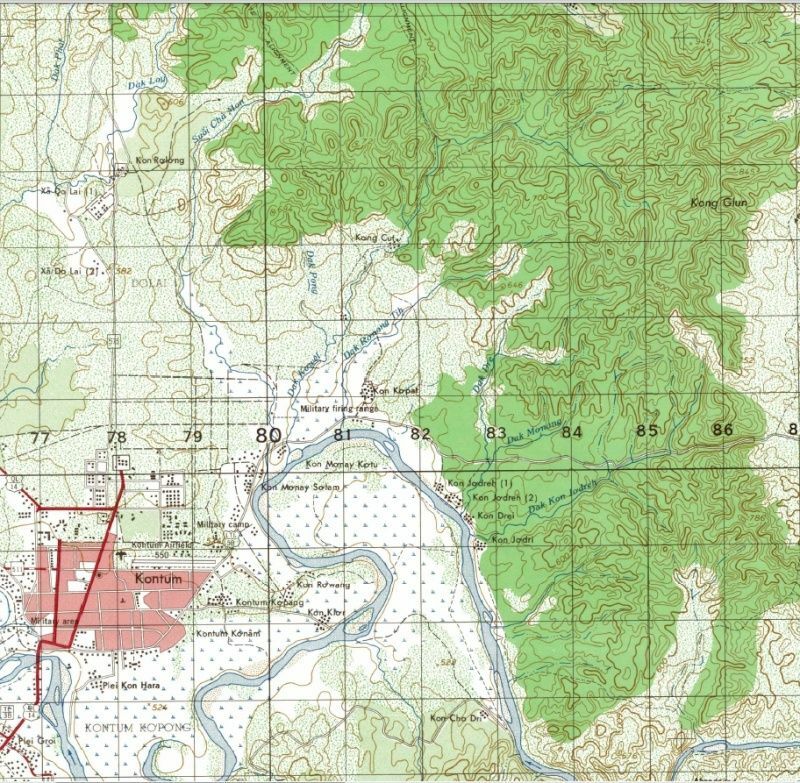 It depicts the area around the US base at Kontum, in the Central Highlands. What the Game is not. Apocalypse Now, Platoon, The Green Berets, or Full Metal Jacket. Neither is it, Blackhawk Down, American Sniper, Green Zone, or the last twenty minutes of Zero Dark Thirty. These last four may seem more obvious than the first group but more about that later. Who will the player represent? There will be up to three teams of players who will represent individual LRRP teams of six soldiers. Each team will have a mission objective and patrol route within an overall AO of approximately 175 sq. km. each. Combat activity will be on a team level basis, so “Rambos” will not be required. Each team will have its own briefing and no team should be aware of another’s route, activity or objectives, unless inadvertent contact is made during the game. Players are asked to observe and maintain this position throughout the game. Three separate groups of men in hundreds of sq. km. – how would you know? Essentially their activities were for Intel gathering, target acquisition and damage assessment but their remit soon extended to, targeted close quarter ambush, destruction of food and arms caches etc. During the war they eventually killed numbers of the opposition forces out of all proportion to their total strength in spite of this stealth remained their primary weapon. LRRPs were formed from cadres of standing units, whose skill sets were already ahead of the conscript GIs in the theatre, so Airborne units provided a lot of personnel. However, while some men in a patrol would already have had served on more than one ‘Tour’, others might be on their first. LRRP training was notoriously rigorous and team leaders were generally graduates of the U.S. Army's 5th Special Forces Recondo School. Teams were deployed as Divisional or Brigade assets and so were set apart from the main day to day Army activity and general outlook. The US Marines had their own version of LRRPs (supplied by Marine Recon Battalions). These tended to be larger and more heavily armed and were generally given to a more ‘Brawn over Brains’ approach. What LRRPs were not is “Special Forces” as we have come to know them today – hence the Iraq based references above, although there were indeed designated “Special Forces” in Vietnam and some of their remit overlapped those of the LRRPs. At any given point all manner of ‘non regular’ units were wandering around the country, or sailing up its waterways on some mission or another, often completely oblivious to other units proposed activity. “A guy could get killed!” - As the saying goes. The Teams were not formed from the modern concept of extremely trained and focused individuals, geared to operate in very particular circumstances that we see today. Nor were they supplied with a whole range of special equipment and back up arrangements. They were a mix of ‘regular army’ and ‘short timers’ although they all had specifically volunteered to join the LRRPs. I mention this only to remind players to narrow their thinking during the game – no MQ-9, piloted from Nevada, will be around to help get you out of a jam and those now familiar goggles that make everything go green in the night time – are still science fiction. There were ‘Starlight scopes’ with a M14/M24 rifle mount, which weighed an additional eight pounds, only worked when the Moon was up and ‘flared out’ at any opportunity, but that’s all. Well, the Patrols were generally equipped with whatever their infantry counter parts had - M14, M16 or in some cases CAR-15 automatic rifles, pistols, knives, hand grenades and M79 Grenade Launchers, as standard. Smoke, fragmentation and phosphorus grenades were also carried along with a small number of Claymore mines for ambush and perimeter defence and a limited amount of C4 explosive. There were usually none of the M60 machine guns, beloved of war films and TV. These weighed around twenty five pounds on their own, without ammunition belts. For stealth orientated missions, over distance, you had to be mad, or a Marine, to carry one. Particularly, as the standard LRRP load out was 60 – 80 pounds to begin with and you were often expected to climb forty feet up a swinging wire ladder into the extraction helicopter! Finally and most importantly, you have the VHF/FM, AN/PRC-25 radio. The ‘Prick 25’, as it was charmingly known, once again standard issue. Range was 3 – 5km, or if the auxiliary Pole Ariel was set up 20 – 25km. The radio was battery powered and in constant use these lasted two to three hours maximum. Players will have seen photos, or footage, of RTOs in Vietnam talking into a plastic bag. This is because the PRC-25’s telephone style handsets were so adverse to moisture that wet ones would cease to function – just what you wanted for operations in South East Asia! Reception and Transmission was dependent on terrain and atmospherics. Moving while using the pole was not an option. LRRP’s were networked onto “X-Ray” teams for C2 relay purposes but there was no guarantee that ‘Air Assets’ would be in direct contact with units on the ground during a mission. By the nature of their role, without the PRC-25, the rest of the world had no idea where a LRRP was or what information it had gathered, or indeed, if it still existed. Regular radio check-in was essential. Finally, LRRPs did have priority access to artillery fire missions (when in range) and both rotary and fixed wing air strikes, dependent on Comms relay and the nerve of the Team Leader. I mention this by way of reminding players that there was no such thing as GPS and at 300mph one patch of jungle looks a lot like the next. It was a brave man – or a desperate one - who called airstrikes in his own grid square! As noted the Team’s main weapon was stealth. Not that they were shy of fighting but rather the best way to achieve their objectives was to remain unnoticed, and fight on their own terms. This didn’t always work out! Teams did not use regular trails or cart tracks, where this could be avoided, as the chance of accidental contact and leaving signs of their passing were too high. PAVN troops were taught seven different standard types of ambush and were generally efficient in all of them. In the game it will be assumed that Teams follow routes parallel to regular trails or cart tracks for ease of planning and umpire communication. Wherever possible Teams did not move at night unless in an ambush position, as it was too easy to initiate accidental contact and/or loose direction. Anyone moving at night, particularly on a trail, was likely to be hostile, an idiot, or imminently deceased. At night, unless expecting to make a hasty move, the Team would go into NDP (Night Defensive Position/Perimeter) – think sleeping rough, inside a ring of Claymore mines - until the next morning. Movement on the map will vary with conditions, as there is likely to be a lot of variation in physical terrain in any one square. The map will show areas that are likely to be slower than others but as in the real case just how slow remains to be discovered. On this basis it is unlikely that the amount of time taken to traverse the map will be consistent from turn to turn. It’s indicative of the LRRPs approach that machetes were not carried on patrol, as cutting a path through dense undergrowth was far too noisy. Squeezing through and around terrain was the preferred method and it was not unheard of for Teams being forced to take 6 – 8 hours to cover 1km in in adverse conditions. There will be three maps available on the day all based on the original 1:50,000 US Army original. Complete reproduction at 200%, for the Main Briefing and Umpire Team use. The Sectional reproductions will be used to track game play and transmit information between Teams and the Umpires. I've signed up for this one. I've read stacks of very cool and very odd biographies by Vietnam vets and have found this war to be one of the stranger and most dubious of the 20th century, and its simply bizarre innocence lost/corruption background make it fascinating. Also... I haven't been to a f-2-f game this year so should stick my head over the parapet. I'm okay with umpiring, being a LURP or Charlie for this. See you there Diggers . Am really looking forward to it too. Vietnam was on the TV every evening while I was growing up. A very formative experience for me. Me too - some of us were in Grosvenor Square with NLF flags on a regular basis! A further reminder that our next game is on Sunday 29 November. Notwithstanding anything mentioned in the doodle, this is set during the Vietnam War. We have 12 registered to play, but I thought it best to check everyone is still coming. Having a better idea of numbers will also help David put the finishing touches to the scenario. Among those who have registered are new players Alex Woodward and Kev Peacock. They will of course be most welcome. Unfortunately I have no emails for you guys, can you PM me please Alex and Kev, so I can ensure you have seen the briefing material? A final reminder that our last game this year is this Sunday (the 29th) November. Notwithstanding anything mentioned in the doodle, this is set during the Vietnam War.